After the trials and tribulations getting planning permission for my mast, and several setbacks since then I have finally got the antennas up and certainly working, at least on 2 metres and 70 centimetres. I have not yet fired up the transverter for 23 cms (I hope it still works after all these years), but I am operational on the two lower bands. So how is the receive set-up? 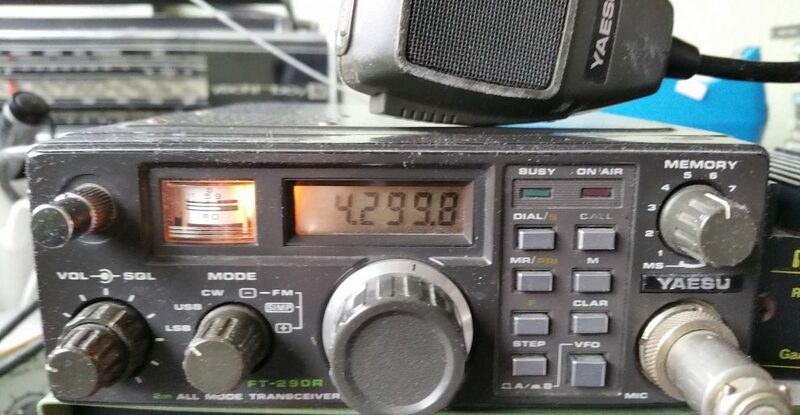 On 2 metres I can hear the Belgian beacon ON0VHF on 144.418MHz consistently just above the noise, but at least as well with my 7 element yagi as the Hockley shop down the road used to with their 20 elements. This is in flat conditions, even poor. I have a GaAs FET preamplifier for 2 metres and am using Ecoflex 15 feeder, but to my ears the readability is not improved by the preamp, which says a lot for the “front end” of the old FT290R I am using as the main transceiver for the moment. Much to my surprise I can also hear ON0VHF above the noise on 70 centimetres using my 2 metres rig’s stablemate, an FT790R, also dating from the early Eighties. Currently I have 25 watts on 144 MHz and have got into Lincolnshire with 1 watt on 70 centimetres, a distance of about 87 miles in flat conditions, and my report was 57. There is a lot to come, especially when conditions may be more favourable. 7 element LFA yagi for 2 metres, 13 element LFA yagi for 70 centimetres and 23 element Tonna for 23 centimetres. This entry was posted in Amateur radio and tagged 144MHz, 432MHz, antenna, mast, planning, yagi. Bookmark the permalink.